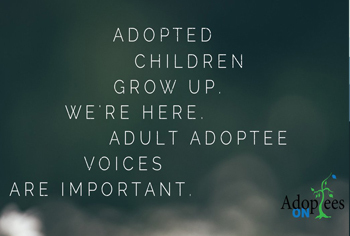 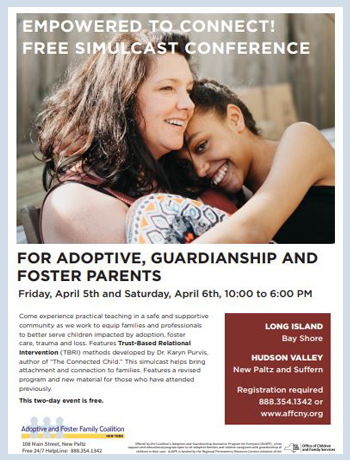 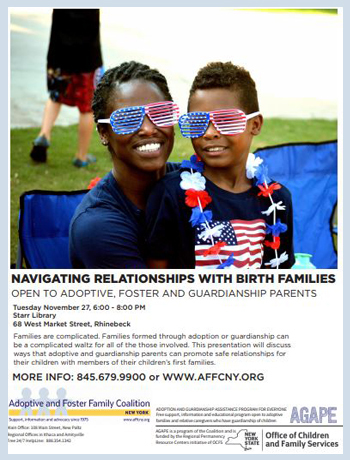 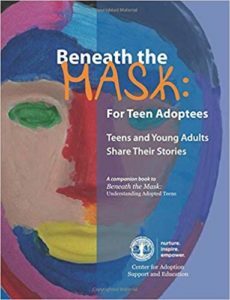 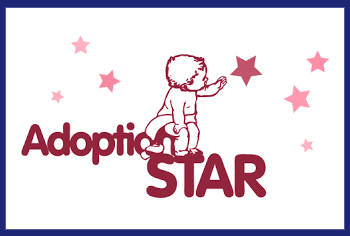 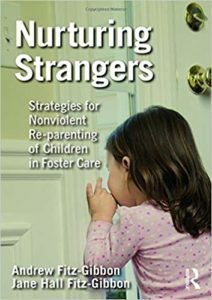 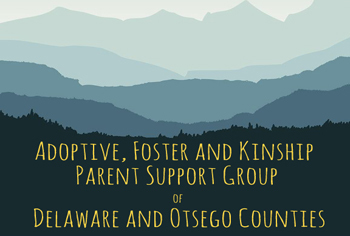 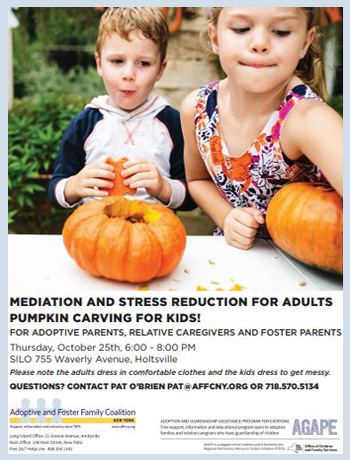 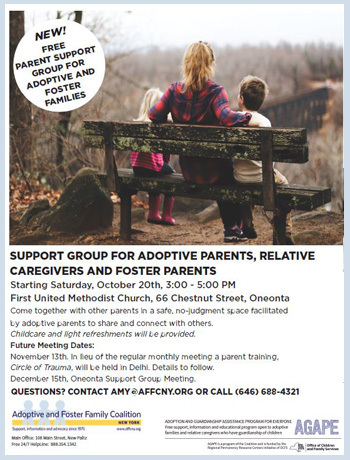 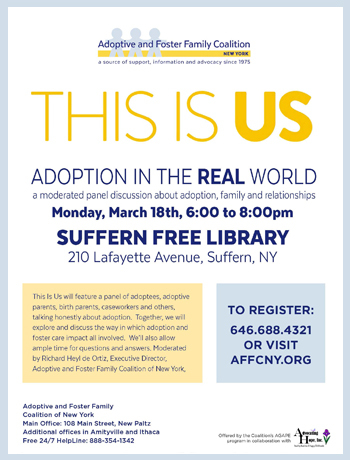 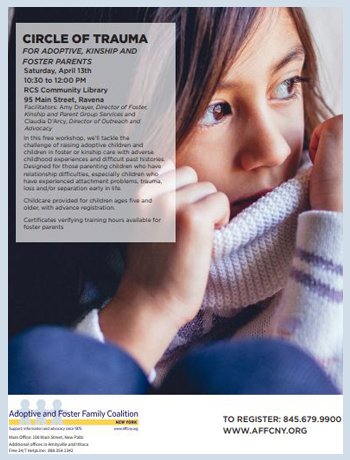 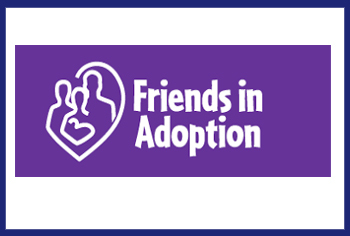 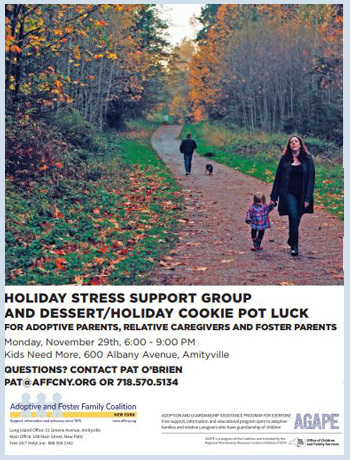 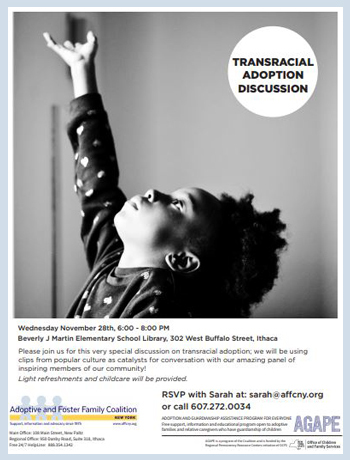 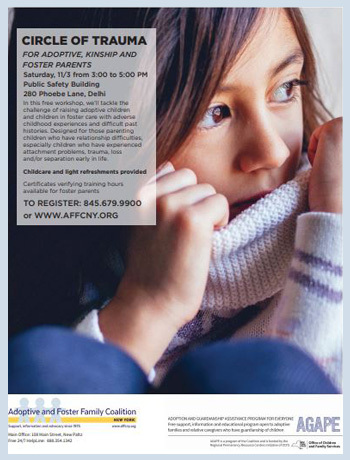 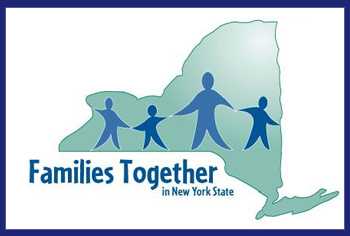 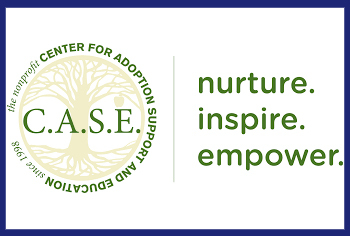 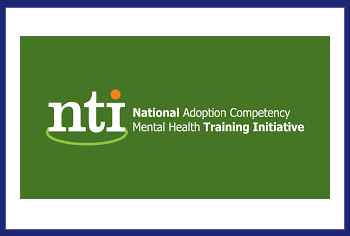 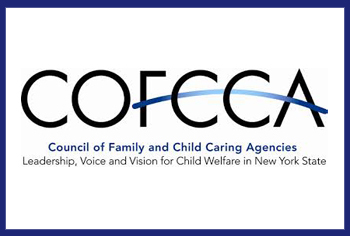 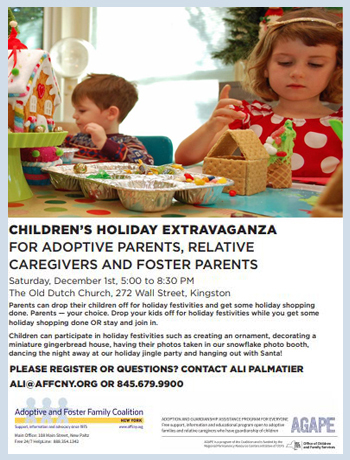 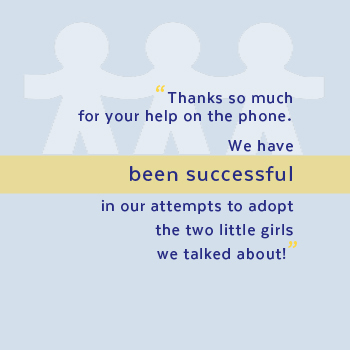 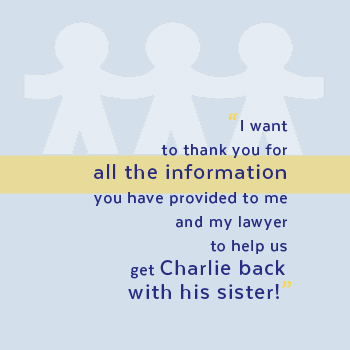 Register Now for Tuesday, 4/30, 6 PM to 7:30 PM at Adoptive and Foster Family Coalition of New York office located at 108 Main Street in New Paltz. 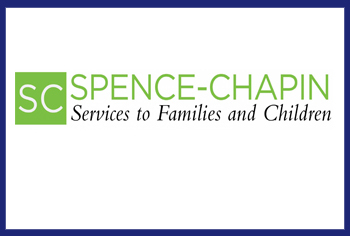 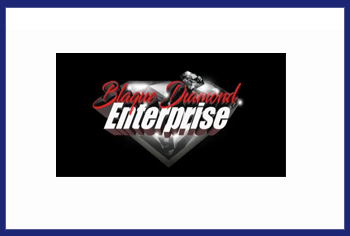 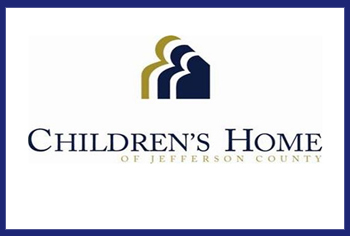 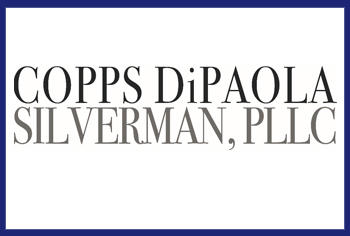 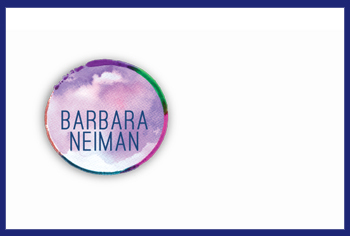 2019 Friday Evening Event Sponsor! 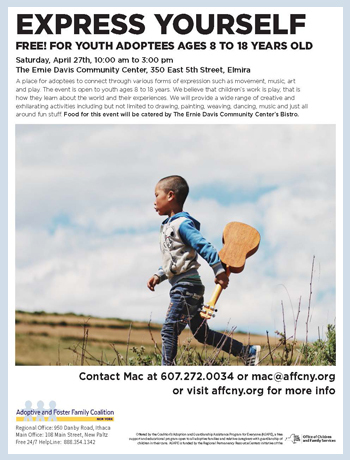 RSVP for Saturday, April 27th from 10 AM to 3 PM at the Ernie Davis Community Center located at 350 East 5th Street in Elmira. 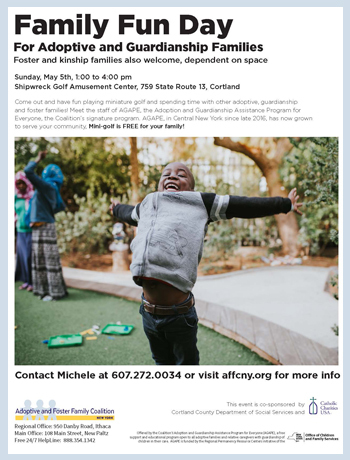 RSVP for Sunday, May 5th from 1 to 4 PM at Shipwreck Golf Amusement Center located at 759 State Route 13 in Cortland. 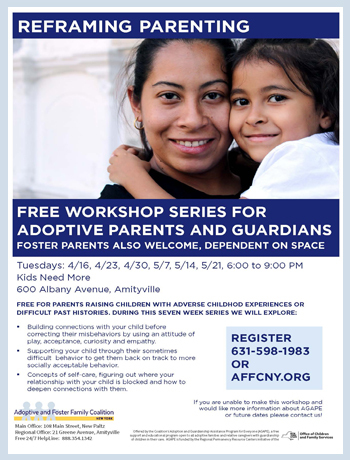 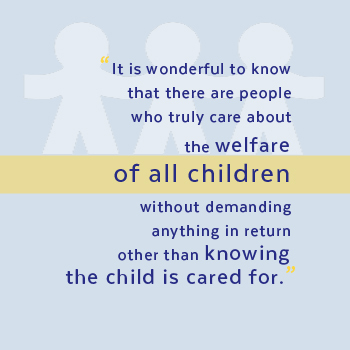 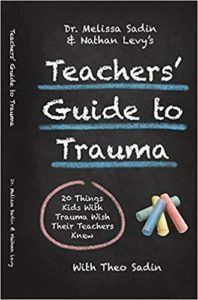 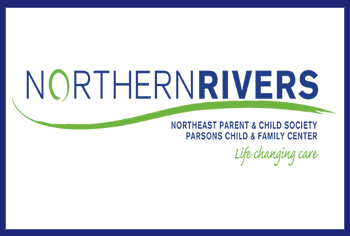 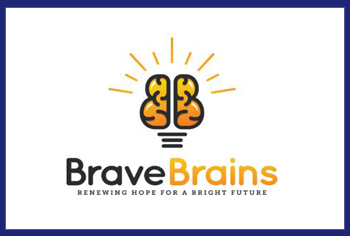 Register for Tuesdays on 4/16, 4/23, 4/30, 5/7, 5/14 and 5/21 from 6:00 to 9:00 PM at the Kids Need More offices located at 600 Albany Avenue in Amityville. 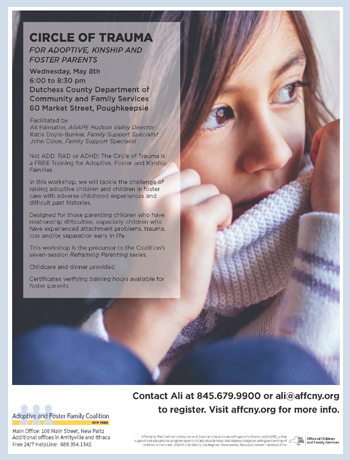 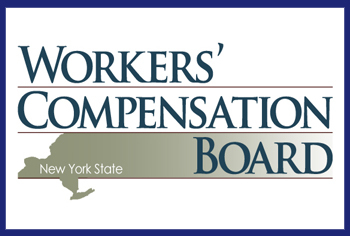 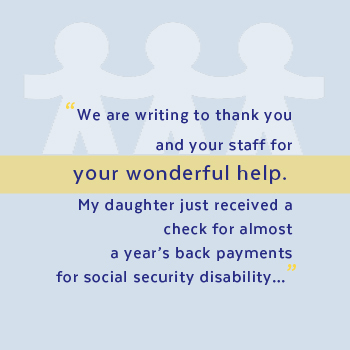 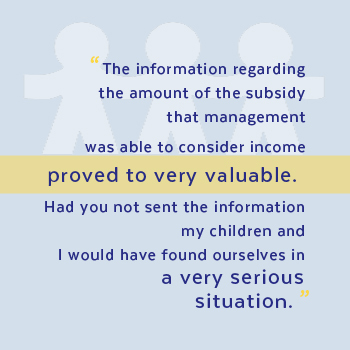 Register Now for Wednesday, 5/8, 6 PM to 8:30 PM at Dutchess County Department of Community & Family Services located at 60 Market Street in Poughkeepsie. 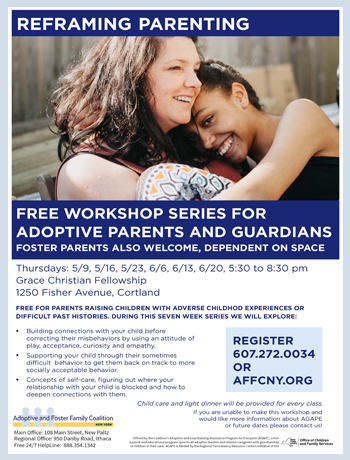 Register Now for Thursdays from 5:30 to 8:30 PM on 5/9, 5/16, 5/23, 6/6, 6/13 and 6/20 at the Grace Christian Fellowship located at 1250 Fisher Avenue in Cortland. 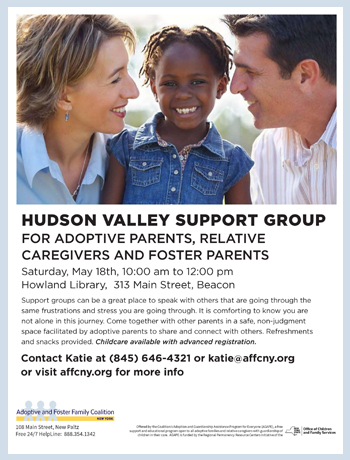 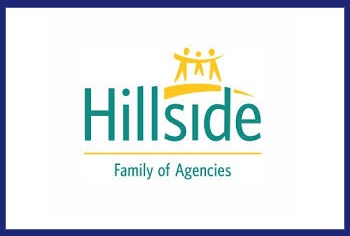 Free Family Fun Day: Hudson Valley Bowling! 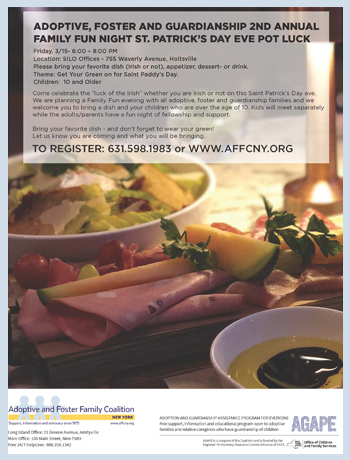 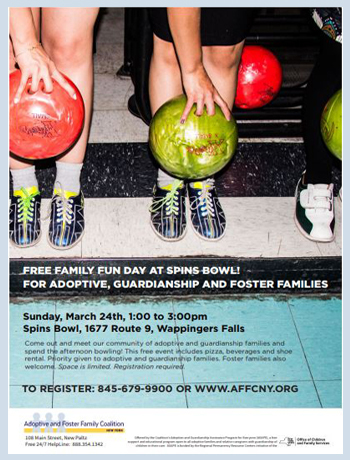 RSVP for Sunday, March 24th from 1 to 3PM at Spins Bowl located at 1677 Route 9 in Wappingers Falls. 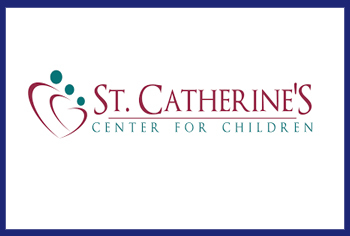 Due to inclement weather this evening we have gone ahead and canceled tonight’s event. 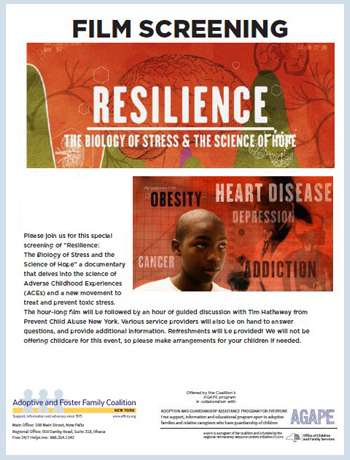 We will be rescheduling this event for Thursday, March 7th in Amityville (@ Kids Need More) from 6 pm to 8 pm. 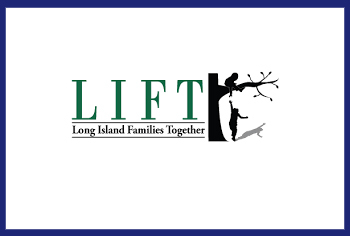 2019 Empowered to Connect; Long Island! 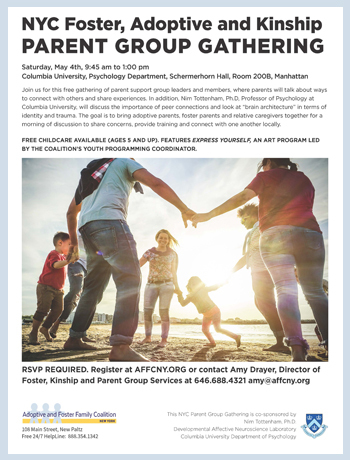 2019 Empowered to Connect; Suffern! 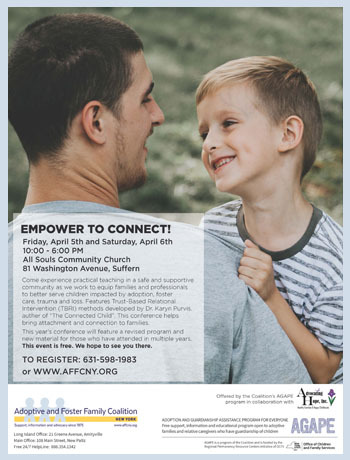 The Empower to Connect Conference 2019 Live Event takes place on April 5th and 6th form 10 AM to 6 PM. 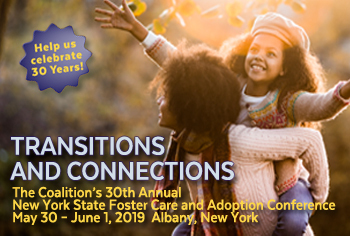 The entire conference is simulcast LIVE to the Coalition’s hosted Rockland location: All Souls Community Church located at 81 Washington Avenue in Suffern. 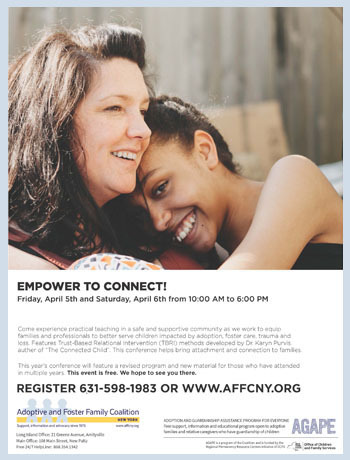 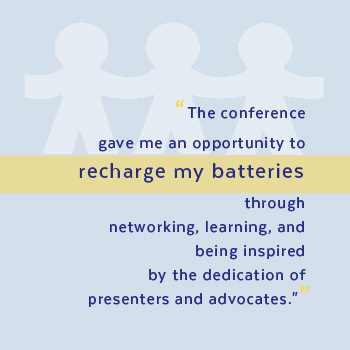 2019 Empowered to Connect; New Paltz! 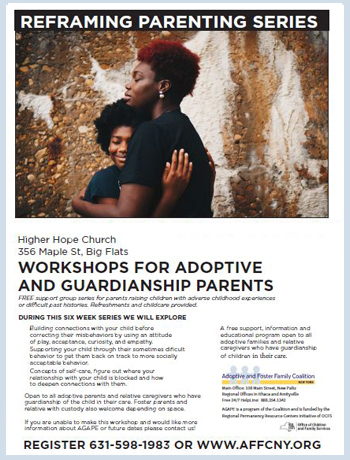 Register now for Tuesdays from 5:30 to 8:30 PM on 4/16, 4/23, 4/30, 5/7, 5/14, 5/21 and 8/20 at the Higher Hope Church located on 356 Maple Street in Big Flats. 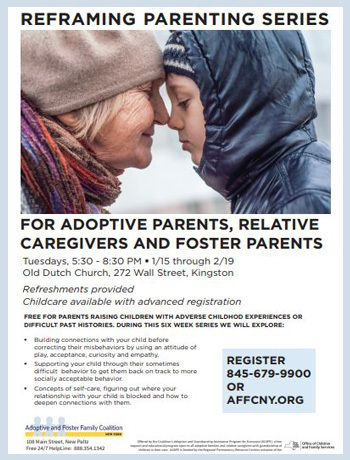 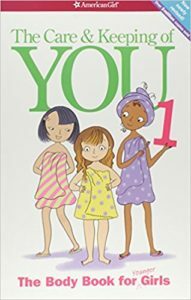 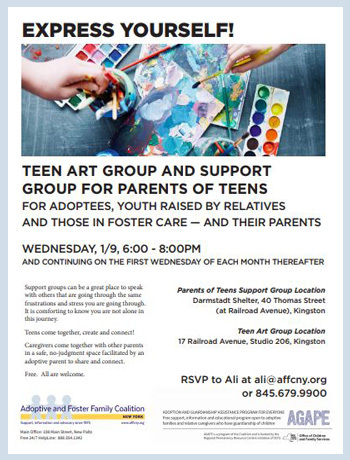 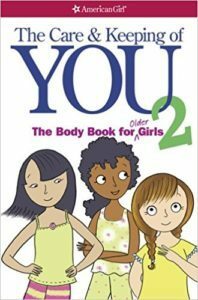 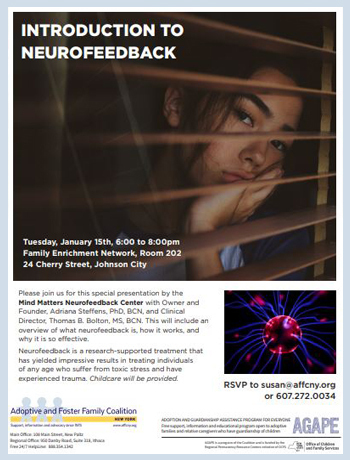 Register now for Tuesdays from 5:30 to 8:30 PM 1/15 through 3/5 at the Old Dutch Church located at 272 Wall Street, Kingston. 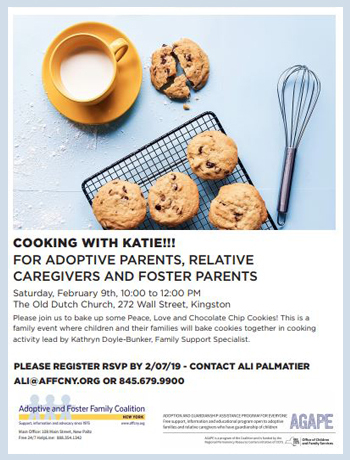 Adoption Connection Kingston; Cooking with Katie!!! 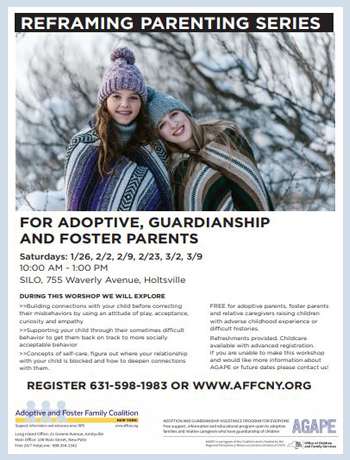 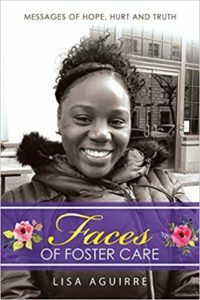 RSVP now for Saturday, February 9th, 2019 from 10 AM to 12 PM at the Old Dutch Church located at 272 Wall Street in Kingston. 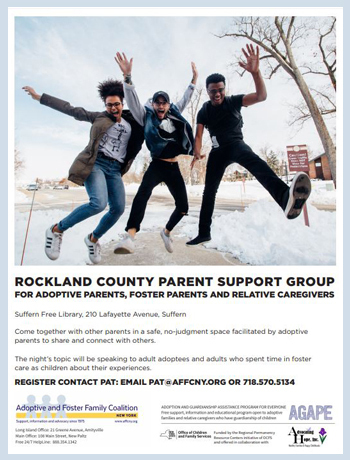 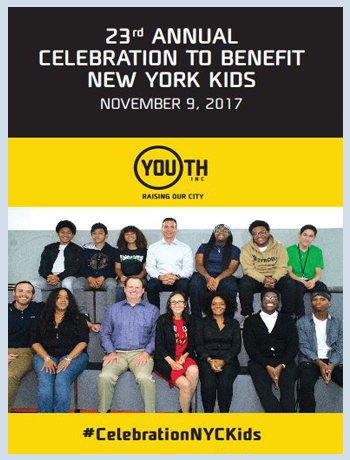 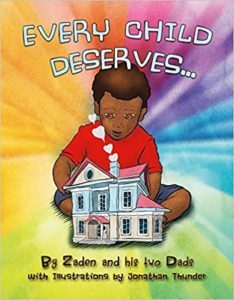 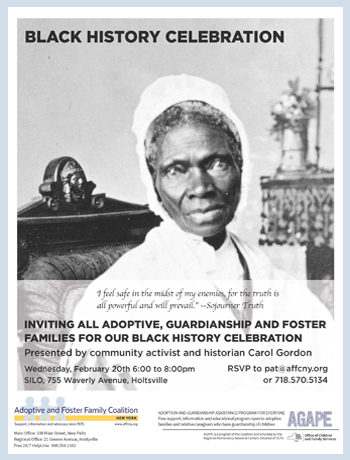 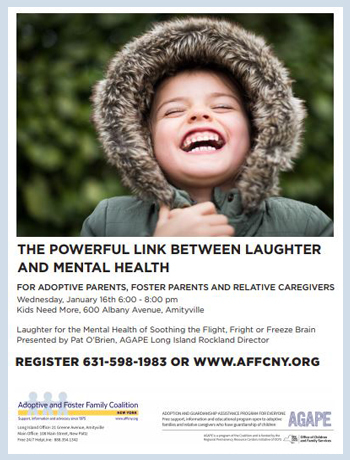 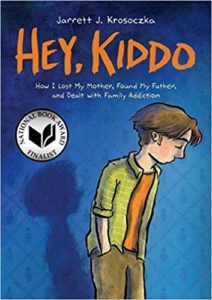 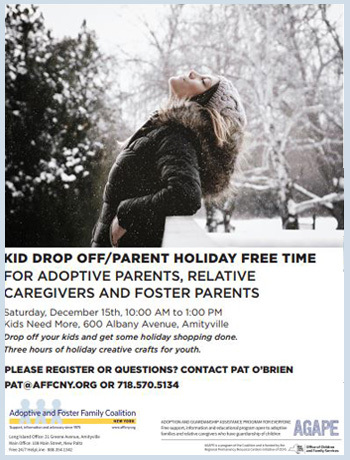 RSVP Now for Wednesday, 3/20 from 6:00 to 8:00 PM at Kids Need More located at 600 Albany Avenue in Amityville. 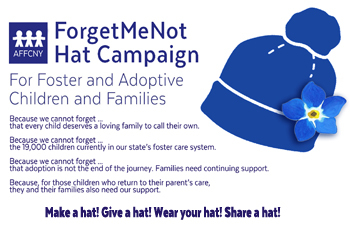 Join the Forget-Me-Not Blue Hat Campaign!